Weather for Saturday is Mostly Sunshine 15ºC - 23ºC with a Gentle South Easter of 15knots - 27km/h changing to South by 16h00. High UV Factor of 7 so please come prepared for sunburn and wind burn. 22% chance of Fog from midnight improving to 8% by 06h00 so please be carefull driving to Vredenburg on the West Coast road. 41% Humidity with Sunrise at 06h51 and Sunset at 19h15. Route will not exceed 1km and will not be shorter than 800m. Leon Engelbrecht will open proceedings with a short scripture reading and prayer. Competitors briefing will follow and please refrain from moving through the gardens - it is only a few steps further to walk around them! This is a public venue and as such public laws apply - no alcohol is permitted anywhere. Please help us retain good relations with all the authorities and property owners as without them you cannot enjoy the sport! 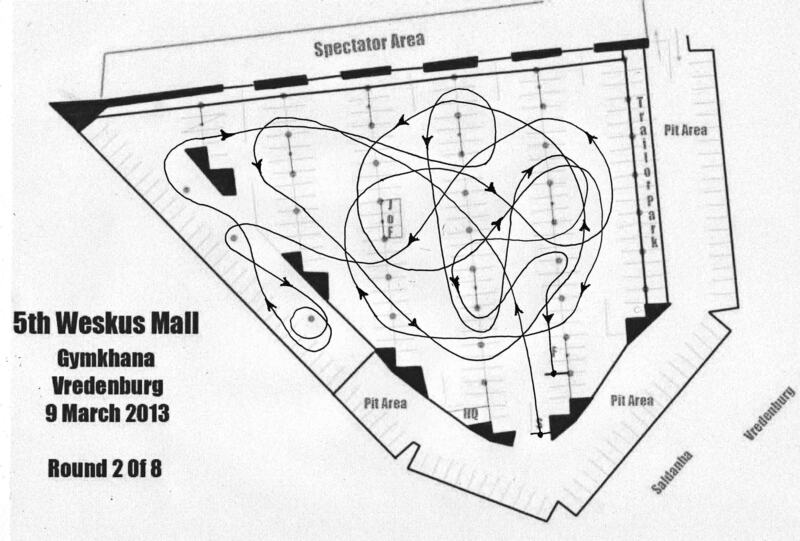 The 5th Vredenburg Mall Gymkhana will form round 2 of the 2013 Witzenberg Motorklub Gymkhana Series. A very popular venue that have developed a love / hate relationship with competitors. Some consider it too difficult and they refuse to contest events at this venue and the complete opposite as true gymkhana enthusiasts accept the challenges of this venue and inevitable gain handsome points benefits by simply competing. Mastering Vredenburg on it's very good surface and unique "rietpolle" have certainly led to some brilliant performances in all classes and 2013 will prove even more interesting. Quite a number of new combinations set to make their debut in the new season too. Supplementary Regulations and permissions completed, awaiting MSA Permit No. Izak van Zyl and Danye Louw was made to work extremely hard for a second consecutive event and they were made to tap everything from their Dynotech class G VW Golf GTi MkII Turbo 2.0 before they could claim victory in the 5th Weskus Mall Gymkhana Vredenburg.